I baulked at posting Part Two of this series because of the collective and almost audible intake of breath when I invoked the word “alchemy.” All it means is to change the nature of something. Forget about the poor medieval numbskulls who mistook the principle of working on the matter of oneself for working on inert matter. 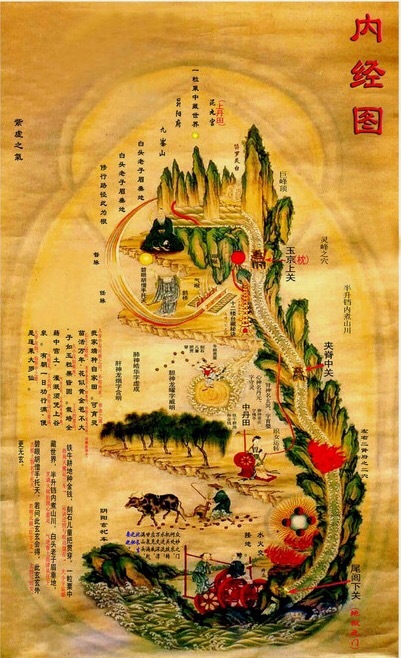 One can imagine how scraps of esoteric taoist texts were picked up in some market on the Spice Road, and from there made their way to Cairo or Damascus and then to the Vatican, to Venice, Barcelona, Marseilles, and from the port cities to the great centers of learning such as Leijden, Paris, London and Copenhagen. And then the media got hold of it: Wijck, Granet, van Heemskerk, Teniers, Bega and Breen. There’s no shortage of oil paint on canvas depicting these latter day celebrity chefs (except their halibut was a lump of lead, and their seasonings were sulphur and cinnabar). These 17th and 18th century painters were the Entertainment Tonight and TMZ of their day, and just like their counterparts today their focus was not on the function but the form. Once we realize that the popular representations of medieval Europe’s “alchemists” are deluded, there is one more barrier to belief. It is the notion that one is a stable entity to begin with, that personality is fixed. Current academic thinking is coming around to this idea, but you don’t have to look very hard at yourself to know that personality comes and goes, often several times a minute and sometimes for six hours or so at a time as you sleep. In the longer term, every time you learn a new skill or start a new job you burn new neural pathways; you change yourself by adding a facet to your personality. I have met many people who work in HR; they scare me. The best ones have a way of cutting through facades and putting an interview subject on edge to see how they deal with it. Of course they’re not like that at home. Or perhaps they are, it doesn’t matter, the point is that they can be more than one person in a day. Alternatively, when you work and spend a lot of time with very young kids you find that it is also quite useful to talk to adults in the same tone. It often makes things simpler, though not always. And finally, give a person a uniform or a badge that comes with authority and see how that can change them. The work of taijiquan is, I think, particularly beneficial work for the human, if done with presence and curiosity. The repetition of the form begins an — now I can use the word — alchemical process, teaching the practitioner a different way of doing things, and distributing a different consciousness throughout the body. My simplistic explanation to myself is that the sharing of awareness with initially the waist and hips and then deeper into the organs and nerve clusters serves to shift attention from cortex, such that the whole body gets a say in operations. Much more democratic, I think. I know that it helped me through the most challenging and rewarding job of my life so far, being a full time parent, but that’s another story. The art of taiji is not unique in its ability to change human matter, it just happens to do a particularly good job. To do anything with attention over prolonged periods turns the activity into an art, and art — where art is modes of expression emerging from the unconscious and given shape by technique — is nothing if not medicine.